New delivery of nickel matt lamp fittings! We would like to inform our customers about new delivery of nickel matt lamp fittings for GU10/MR16 lamps. All of the above are also available in chrome. Basic fittings and round movable fittings are also available as white and antic brass. Modern HST has installed a solar street lamp in Sukowy (Kruszwica community), with 30W LED lamp, powered by two 180W solar panels. The lamp had a 5m high pole especially reinforced for the local windy conditions. The community didn't have to wait for the building permit, the lamp was already operational on the first evening after installation. 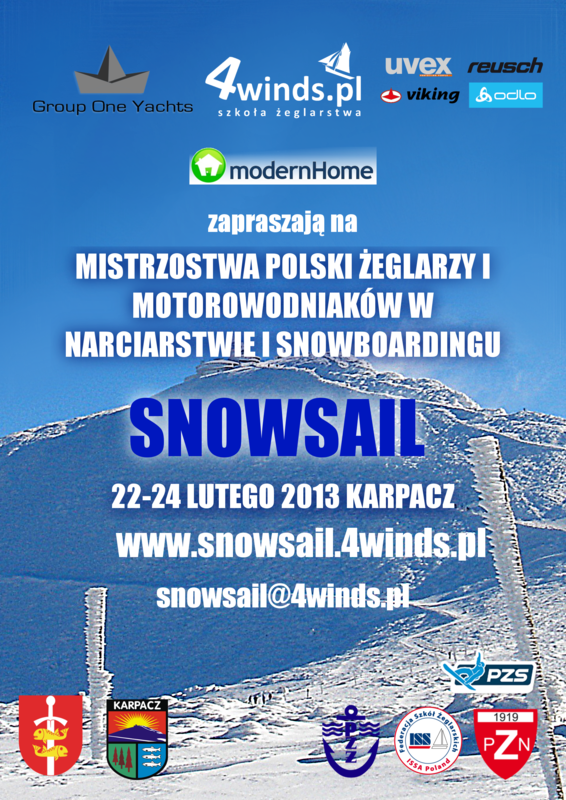 We invite You to Polish Championship of Sailors and Motor Sport fans in Skiing and Snowboarding SNOWSAIL 2013! Modern HST would like to invite You to Polish Championship of Sailors and Motor Sport fans in Skiing and Snowboarding SNOWSAIL 2013. The Championship is going to be held in Karpacz at 22nd-24th February 2013. Competitors will be using Bialy Jar slope. The competition is open for anyone with sailing licence. Our company has became a partner at the championshps, we're funding one of the rewards (20W Flexible Solar Panel + charge controller). We are hoping that the reward will help a lucky sailor/snow sport fan to start a new sailing season with a smile! Click here for more info(Polish)! We are proud to announce that Modern HST has won the government project for installation of solar street lamps in Malczowko, Potegowo community. The project consisted of 4 solar street lamps, situated at the bus stops, and by the pedestrian walkways. Solar-powered lamps were a big success, our company installed another 7 lamps that provided the lighting for the local fire department depot in Potegowo. Installation of a hybrid and solar street lamps in Sierpc. Modern HST has installed two solar street lamps in Borkowo Wielkie and Borkowo Koscielne. Project was governed by Sierpc community. In Borkowo Wielki we have erected a lamp with a single iight source, with 30W LED lamp, powered by two 180W solar panels. At Borkowo koscielne: two light sources - 2 x 20W LED lamps powered by two 180W solar panels + 400W 24V wind turbine. Solar powered street lamps for Fabianki community. Our company has installed two solar street lamps in Chelmice Duze. Project was set up by Fabianki community. The street lamps used 20W LED fixtures, powered by two 100W panels each. Our power-saving lamps were built near the bus stop and pedestrian crossing. Solar powered lamps are an excellent choice, which saves the expenses fro the community. It might be one-time bigger cost of installation and the lamp itself, but it has no additional costs whatsoever from the moment of installation on. It has a greater life span than traditional street lighting, does not require building permits, does not need grid connection. LED lamps are an excellent choice for the street lighting, bus stop lighting, park lighting etc. After taking all costs into account, solar powered lighting is less expensive in the long run. Modern HST has installed two solar powered lamps (DECOR series) for Hajnowka City. Each lamp is equipped with 10W LED lamp and 100W solar panel. Thanks to solar power, the lamps do not require electric grid access. The lamps were installed on private terrain, because of the lack of space by the street sides. Another project for the Cewice community. Modern HST has installed six solar powered street lamps in Cewice community. The lamps had 7m high poles, 30W led lamps, each powered with two 180W solar panels. The locations (Cewice's villages) were chosen because of their difficult access to the electric grid. Solar powered street lamps work for Cewice very good, it is a second project made by our company for that community. Eighteen solar street lamps for Czarna Dabrowka community. Modern HST is proud to announce, that between 12 and 14th of July 2012 our company has installed eighteen solar powered street lamps for Czarna Dabrowka community. Czarna Dabrowka – 3 szt. Thanks to the new technologies solar street lamps could be installed in remote places, without access to the electric grid. Czarna Dabrokwa community is a first local community that decided to invest in solar powered lighting. Project was funded by communinty's own money. We would like to inform that Modern HST has finished installation of a government project consisting of installation of sixteen hybrid wind/solar powered street lamps for Sztum community. Each lamp was 8m high, and used 2-module 40W LED lamps, powered by two 190W solar panels and 400W wind turbine. All of the lamps are RF controlled. It wasn't our first project in Sztum community, In 2011 we have installed nine solar powered lamps in Sztum.